I can critically think about situations instead of only superficially looking at it. I have gained this experience throughout my college courses. I try my hardest to problem solve with customers at my current job whenever a situation arises. At my current and previous job I've been in a customer service position. 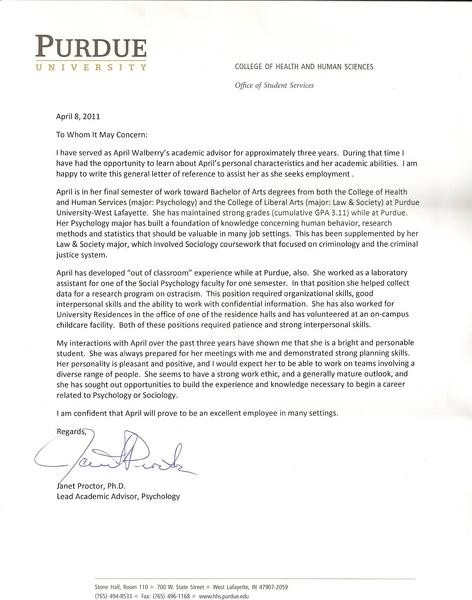 My name is April Walberry and I am graduating from Purdue University in May. I will be receiving a B.A. in Psychology as well as Law and Society. Throughout my time at Purdue I have learned a wide variety of subjects and participated in research experiments, clubs outside of class, and an on campus job. During these experiences I have increased my knowledge of psychology, personal interactions, and customer service just to name a few items. 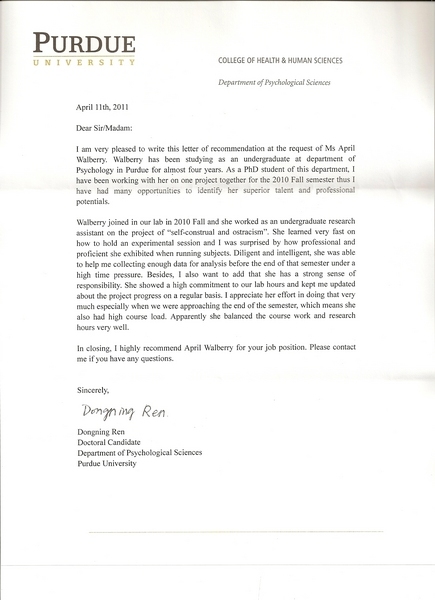 Out of those experiences I am most proud of the work I accomplished through the research I was able to participate in. I had the opportunity to help a Doctoral candidate with her work on ostracism, and it showed me how enjoyable research can be. Through my on campus job at a residental hall I have gained hands-on experience in customer service, which is a vital component in the professional world. Learning to handle stressful situations and problem solve with customers is an important skill to have in any occupation. If you have any questions feel free to contact me at the email listed above. I'll be more than happy to answer them for you. I enjoy shopping, kayaking, cooking, and eating with family.